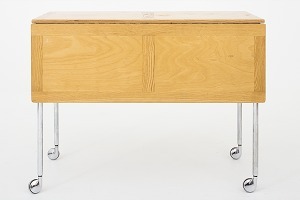 Bruno Mathsson was a Swedish furniture designer and architect with ideas colored by functionalism/modernism, as well as old Swedish crafts tradition. Being the son of a carpenter in the town of Värnamo in the South of Sweden, it was fairly obvious what work the young Bruno would choose. After a short time of education in school, he started to work in his father's gallery. He soon found a great interest in furniture and especially chairs—-their function and design. Eventually he developed a special building technique for wooden chairs where the components were bent and glued under the action of hot water.